Investigating the roles, therapeutic targeting and clinical relevance of microRNAs in COPD. What are some of the key findings, progress and discoveries you have made, or hope to make, with your research to date? I hope to make discoveries that will be developed into more effective therapies for people with Chronic Obstructive Pulmonary Disease (COPD). Our research team led, by Professor Phil Hansbro, has developed a unique experimental model of COPD that is highly representative of human disease. I have used this model to collect preliminary evidence that shows that the levels of a recently discovered type of molecule, known as microRNAs, changes as the disease progresses. So far, I have shown that one of these microRNAs plays important roles in the development of experimental COPD and that it is also changed in humans with this disease. What do you hope to achieve with this research project? The overarching goal of this research project is to increase the understanding of the mechanisms that drive the development of COPD. I will target specific microRNAs that are changed in experimental COPD to examine their roles and potential for therapeutic targeting, and then confirm my observations in human patients. How important was the funding from Lung Foundation Australia to your work? 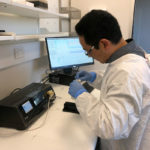 The funding from Lung Foundation Australia will provide me with an invaluable opportunity to pursue my research, which aims to identify the mechanisms that drive the development of COPD and new therapeutic targets. This research project would not be possible without funding from Lung Foundation Australia. Do you have a message for Lung Foundation Australia’s supporters? Lung Foundation Australia is an incredible organisation that actively supports the next generation of scientists to pursue cutting edge research in a range of chronic lung diseases. This kind of support enables Australia to remain at the forefront of lung research and fosters early career lung research scientists. This fellowship is essential for me to continue my research, which has strong translational potential, and to further develop my career. I would like to personally thank all of the supporters of Lung Foundation Australia for this opportunity.